Maeklong railway market is really no distance at all from Bangkok, is easy to get to and well worth the trip. 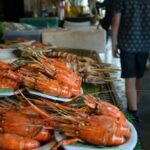 The Maeklong market itself is a fascinating warren of stalls many selling local seafood, but it’s the trains passing through that most want to see. We’ve tried getting to Maeklong by local bus ( minibus) en-route to Amphawa and the floating markets of Samut Songkram and also by private day tour from Bangkok. Your choice must be based on budget, time , itinerary and your preferred style. More on the Maeklong Railway Market and ways of seeing it below. 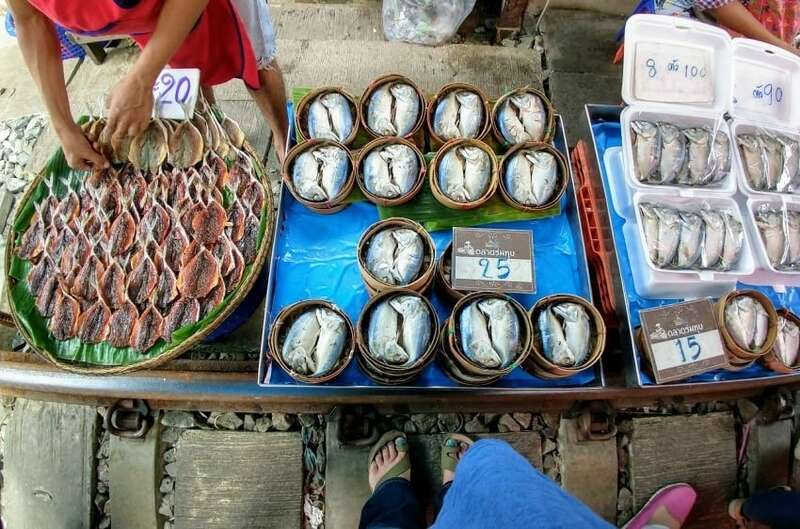 Maeklong specialises in seafood and these fish are presented in the traditional way for the region. You can even buy cuddly toys of these bent-backed critters. The stalls are on the railway tracks. A few minutes before the trains arrive the whole market shifts back a meter or two. 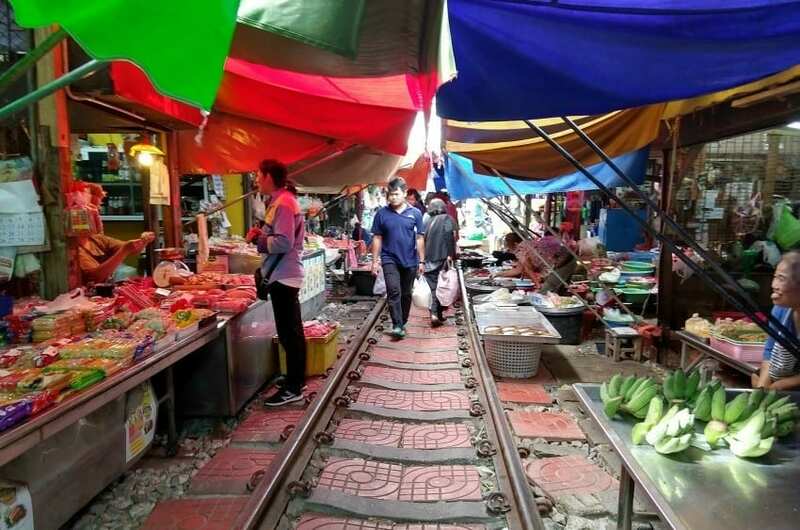 Is Maeklong Railway Market Shut? Flooding in Maeklong when we visited. 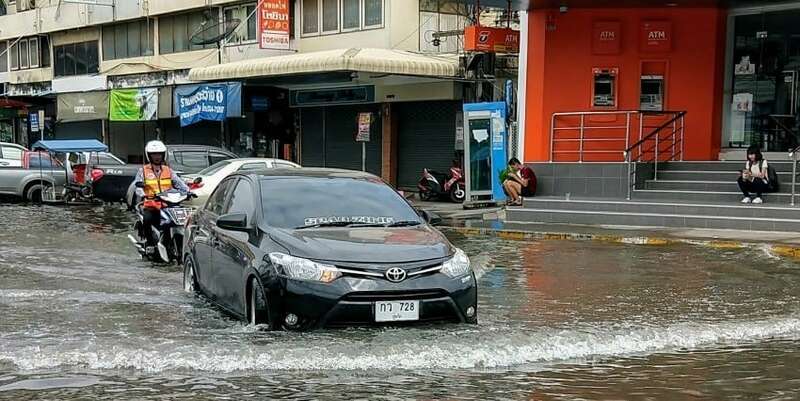 The railway market was dry but much of the town under water, we had to jump in a songtaew to get from the car park to the railway market or else wade through evil-smelling flood waters. It has been shut from time to time in recent years and the trains have stopped running. There was a fire that closed the market and some floods, but at the time of writing the Maeklong Market was open for business and the trains were running 8 times per day. 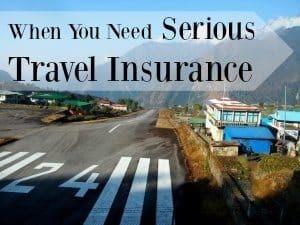 We found having a guide invaluable in that he was local and knew exactly where and when to get us, but travelling solo is not a bad idea at all. More information on train times below. What Times do the Trains Run at Maeklong? Trains run 8 times a day, but get there early to buy your frog on a stick on a railway track. If you get to Maeklong late and decide to stay overnight, there are hotels in Maeklong town. There are are also some lovely accommodation options in Amphawa itself, which is very close, with hostels and hotels right on the water’s edge. This part of Samut Sogkhram is a beautiful water-world of rivers and canals so there are some lovely waterside hotels nearby. Hometown Hostel (inspect here) is probably the closest place to the actual Maeklong Market, within walking distance of the bus drop-off, and is cheap with an excellent 9.2 score on Agoda. To view more options in the area take a look here, there really are some beautiful hotels with great prices in the Amphawa area. The bus to Maeklong departs Bangkok from either Mo Chit bus station or the Southern Bus Terminal (Sai Thai Mai bus station). Both trips are around 90 minutes. The bus will cost you 70 to 90 Baht, ( $2-3) with Southern being the cheaper. These buses run every 40 minutes from Southern Bus Terminal, every hour from Mo Chit. You can just turn up and get on a bus or book ahead using 12 Go Asia. Between trains Maeklong is a bustling market, as a train approaches Maeklong station, the awnings and stalls retreat in a well ordered, well practiced manoevre. The train that passes through Maeklong is mostly a tourist train and one of the slowest in the world. The Maeklong railway stretches from Maeklong Station to Phak Klong San Bangkok. 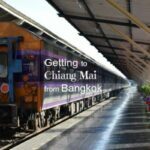 If you want to travel to Maeklong by train the journey from Wongwian Yai Railway Station ( this is not far from it’s own BTS station, on the BTS Silom line) takes around 2.5 hours and will cost you less than the bus. You will need to change trains and cross the river by ferry at Mahachai Station (Mahachai Pier). On the other side of the river resume your journey at Ban Laem Railway Station, the line continues straight on into Maeklong. It’s really not far at all, so yes, taking a taxi to Maeklong could be a viable option. Bangkok taxis are cheap, just make sure your driver uses his meter. We generally find Uber more expensive than Taxis in Thailand. 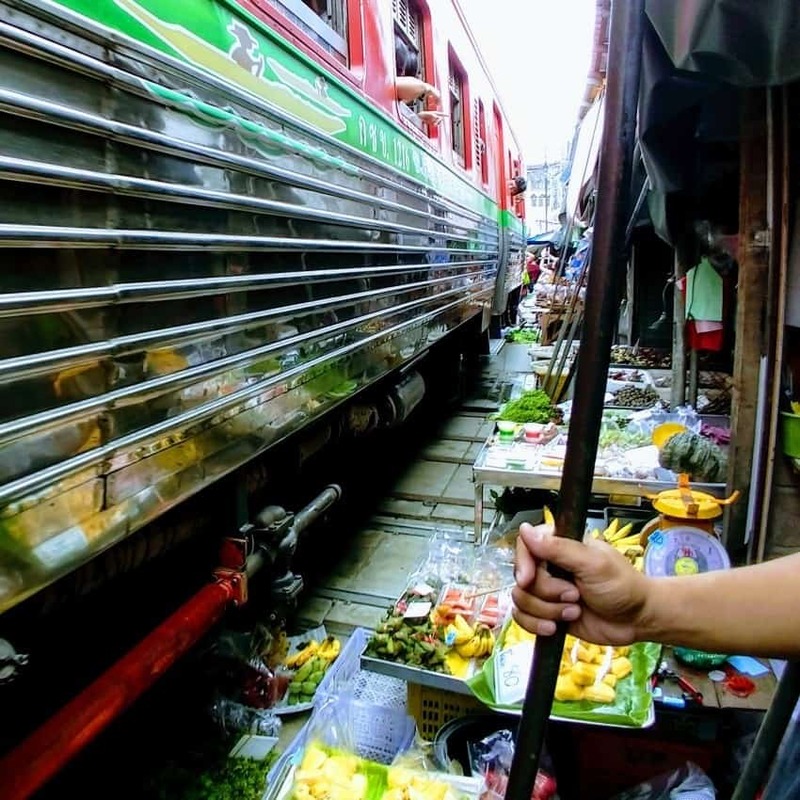 Make sure your Maeklong tour gets you to the market for train time, it’s an amazing thing to see. There are many ways of taking a tour to Maeklong. 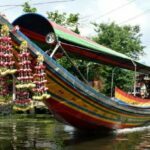 We have used this tour with a local company, it included Tha Kha floating market and the Amphawa area, being a private tour we could stop at any extra places we liked and our local guide was a huge help. It’s not a cheap option, but split between 4 people the cost comes right down. ( see more on this tour here) . Get Your Guide are another good option, we use this company often and they are invaluable when you need to mark in a particular tour for a particular day. They have a best price or money back guarantee. 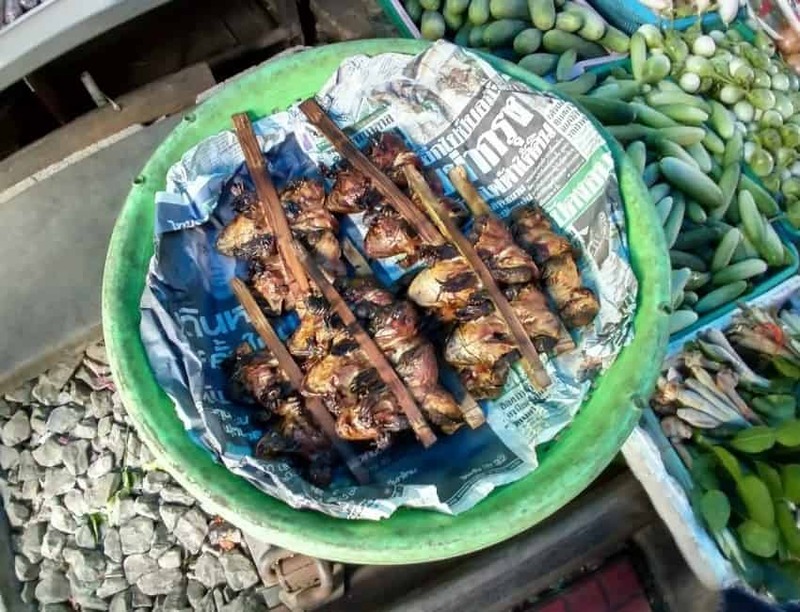 See their Maeklong Railway Market tour here . Again, it’s not cheap, the tour above by private vehicle seems a better deal to us. Their current Maeklong tour includes Damnoen Saduak floating market which is, unfortunately, our least favourite and the most touristy of the markets nearby. Our favourite way to see this area is to spend a few days down here, Amphawa is a weekend, evening market, so it makes for a great weekend away. See our full post on Amphawa here. 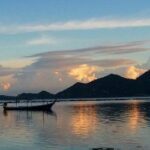 This area of Thailand is one of our favourites with much to offer visitors and a feel of “real” Thailand. 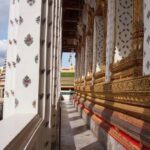 Some of our best trips of recent years have been around Maeklong, Amphawa, Tha Kha and the countryside of Samut Songkhram. Escape Bangkok for a day, do something different without the hordes of tourists that visit Damnoen Saduak every day. Back to our main Thailand Travel Page here. You said the train goes thro 8 times a day – but didn’t say what times!!! That is correct, I didn’t. You’ll have to check that locally because it changes and they don’t always run.